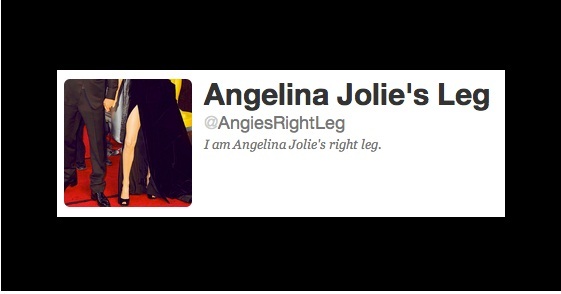 Twitter handle AngieRightLeg a.k.a.Angelina Jolie's Right Leg so far has 35,588 followers on Twitter. Angelina Jolie's Right Leg instantly became the subject of an immediately ubiquitous internet sensation on Monday after the Versace-clad star, 36, self-consciously flaunted her gam (an old fashioned slang word for a "leg".) with a brazen pose onstage at the 84th Academy Awards and on the red carpet. If you want to catch the latest internet sensation on twitter, please log in to your twitter account then add me and Tweet to Angelina Jolie's Leg @AngiesRightLeg I am Angelina Jolie's right leg. “Look at me!” said the leg, 45 minutes after Jolie shimmied onto the stage to present the best adapted screenplay Oscar, flirting shamelessly with the camera by holding her leg just so. “I’m over here!” “I’m a leg, get a load of me!” and “You have to admit, I’m one hell of a leg,” it added. At the Oscars, Jolie's glamorous black dress featured a split by her right leg. She appeared to accentuate it while presenting the award for best adapted screenplay. One of the winners of that category, "The Descendants" co-writer Jim Rash, mocked the pose while accepting his award. Oh yes, dear readers, Rash quickly adapted Jolie's pose. He quips it was a loving tribute! Actress Angelina Jolie arrives at the 84th Annual Academy Awards at the Hollywood & Highland Center February 26, 2012 in Hollywood, California.